A FEDERAL JUDGE has ordered the Trump administration to immediately return the White House press credentials of CNN reporter Jim Acosta. US District Court Judge Timothy Kelly, an appointee of President Donald Trump, announced his decision following a hearing in Washington DC today. The judge said Acosta’s credentials would be returned immediately and reactivated to allow him access to the White House. CNN had asked the judge to force the White House to immediately hand back the credentials that give Acosta, CNN’s chief White House correspondent, access to the White House complex for press briefings and other events. CNN asked for Acosta’s credentials restored while a lawsuit over his credentials’ revocation goes forward. The judge said the government could not say who initially decided to revoke Acosta’s pass. The White House had spelled out its reasons for revoking his credentials in a tweet from White House Press Secretary Sarah Huckabee Sanders and in a statement after CNN filed its lawsuit. But the judge said those “belated efforts were hardly sufficient to satisfy due process”. The judge also found that Acosta suffered “irreparable harm”, dismissing the government’s argument that CNN could just send other reporters to cover the White House in Acosta’s place. 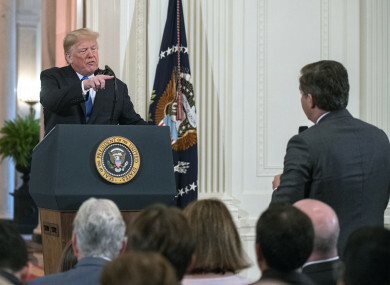 At last week’s press conference, which followed the midterm elections, Trump was taking questions from reporters and called on Acosta, who asked about Trump’s statements about a caravan of migrants making its way to the US-Mexico border. After a terse exchange, Trump told Acosta, “That’s enough,” several times while calling on another reporter. Acosta attempted to ask another question about special counsel Robert Mueller’s Russia investigation and initially declined to give up a hand-held microphone to a White House intern. Trump responded to Acosta by saying he wasn’t concerned about the investigation, calling it a “hoax”, and then criticised Acosta, calling him a “rude, terrible person”. The White House pulled Acosta’s credentials hours later. The White House’s explanations for why it seized Acosta’s credentials have shifted over the last week. Email “Judge rules that White House must return Jim Acosta's press credentials”. Feedback on “Judge rules that White House must return Jim Acosta's press credentials”.